In an exciting new development for 2017, we will be introducing North Area Junior Orienteering training days! 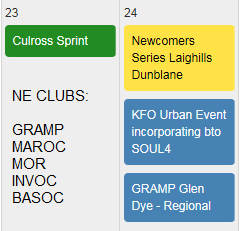 *To provide coached training opportunities outwith club orienteeringfor TD3 (Orange) and above juniors. *To provide fun and motivational opportunities for juniors in the North of Scotland. *To provide a stepping stone between club and national squad level. The training days will not be selected, however all juniors attending need to be confident at completing an orange (TD3) course independently. Last chance to sign up for the first North Area Junior Training day on 18th February! I need to have confirmed numbers by Sunday night (5th February) so that I can ensure we have enough coaches lined up for the day. I’m sure there’s lots more who would like to join us! Anyone under 20 who can independently conquer a TD3/orange course is welcome, even if you’re in ScotJOS. Also, remember to get designing your North Area logos so we can vote on them at Culbin. More details for the training day will go directly to those who are attending in the week beforehand.